We discovered that EgyptAir easily and often change or cancel their flights, sometimes with little notice. 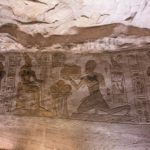 Our flights from Aswan to Abu Simbel return, planned well in advance, were such flights. 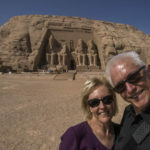 And because of the knock on effect to our same day flights to Cairo, it caused us to be out of pocket as they accepted no responsibility for the consequences of their actions. 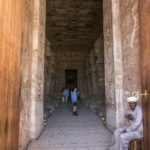 The additional result to extra monies spent was a four-hour wait at Aswan airport. For two of those four hours, we were the only passengers in the place. For us even to get in, security staff had to come back on duty and crank up the machines. We were a little concerned to see all of the eateries closed, but so very grateful to the man behind the counter at the pizza place who offered to make us some freshly cooked deliciousness. Yes, please! So two honking big pieces of pizza and 500ml of Stella each later, we were sitting pretty. Server at the food place, 1, EgyptAir minus 10! 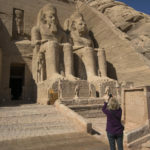 But, back to the Abu Simbel story – the experience of these magnificent monuments was totally worth all of inconvenience and EgyptAir incompetence. 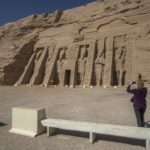 The Abu Simbel temples are two massive rock temples near the border of Sudan on the western bank of Lake Nasser (a UNESCO World Heritage site). 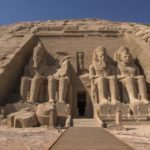 They were originally carved out of the mountainside in the 13th century BC during the reign of Rameses II as a lasting monument to the king and his queen, Nefertari. 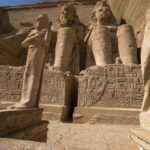 The temples are another piece of extraordinary Egyptian history, as was the ingenuity in the relocation of them when threatened by the creation of Lake Nasser with the building of the Aswan High Dam. 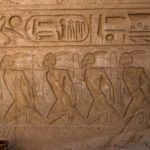 In 1959 there began an international campaign for donations to save the monuments of Nubia and the relocation process went from 1964 to 1968 at a cost of $40 million USD (the equivalent of $300 million today)! We stood down the hill from the temple entrance taking our wide shots of the statues, arms over our eyes wishing we had brought our umbrellas to shield us from the heat. It was only in the low 30s Celsius, but it was still bloody hot. Could not imagine the 50 it would be in summer! We strolled around the base of the huge man made mountain and started in the smaller of the two temples. 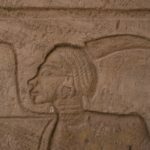 It was a nice change to see these murals only defaced by the ignoramuses of the 1800s with their graffiti rather than the complete destruction of the beautifully carved faces and genitalia by the Copts. In the larger of the two temples, we even saw a rendering of the god of fertility and sexuality, Min, who still had his erection in tact. Here is a video of someone else’s experience of the temples. While we only had an hour at this UNESCO site, what an hour it was! But we were relieved when we escaped the building heat by boarding the airport bus that would take us to meet our flight. 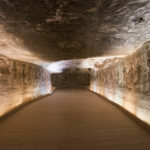 This entry was posted in Africa, Egypt and tagged Abu Simbel, Africa, Aswan, Egypt, Egypt Air, Nefertari, Rameses II, UNESCO by bontaks. Bookmark the permalink.